The three winners of WTOP's 2018 Junior Reporter Contest visited the Glass-Enclosed Nerve Center, ready to learn about radio and to share their own stories. See photos and video of their visit, and watch their winning reports. WASHINGTON — Three very special guests shared their broadcasting talents at the Glass-Enclosed Nerve Center on Monday. The winners of WTOP’s 2018 Junior Reporter Contest arrived at the Northwest D.C. newsroom, ready to learn about radio and to share their own stories. 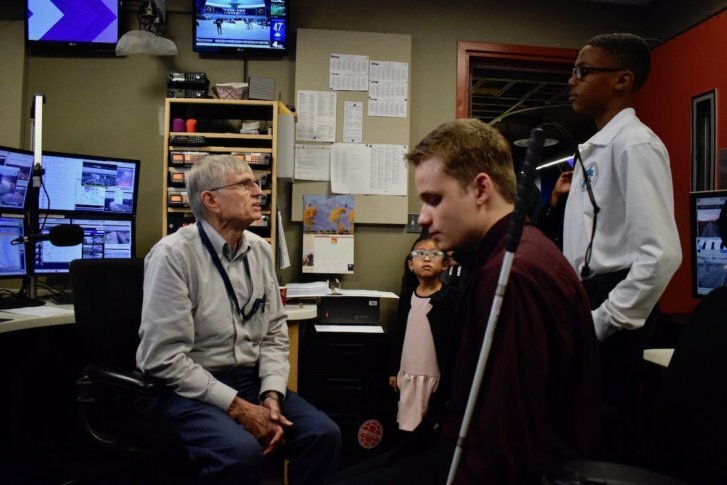 They were introduced to the WTOP Traffic Center with traffic reporter Bob Marbourg, saw WTOP afternoon anchors Hillary Howard and Shawn Anderson in action, and even got to record in a studio. “This place is awesome, actually. It was cool to see all the studios, all the computers, all the people working hard to broadcast the news to everybody. Everybody’s working hard, and I look up to that,” said Duane Benjamin Sylvestre, the winner in the sixth to eighth grade category. The other winners are Lana Basri, who won in the kindergarten to fifth grade category, and Brendan Friedrich, who won in the ninth to 12th grade category. As part of their prizes, the winners each received $500 and their respective schools each received $1,000. Lana Basri, a second grader at Glenallan Elementary School in Montgomery County, Maryland, said that she wants to be a reporter in the future, much like her mother. But, instead of radio, she said she prefers being on TV. For her submission, Basri focused on the Little Free Library containers installed in her neighborhood. “I donate books and take books from them. I like reading,” she said. Basri said she wants to use her prize money to help kids affected by an earthquake in Indonesia, where her mom is from. Indonesia was hit by several devastating earthquakes this year. In September, a 7.5-magnitude earthquake affected a part of the island of Sulawesi, triggering a tsunami and killing and displacing thousands. “There was an earthquake and kids lost their homes. Now, they have to live in tents. So, I’m going to use that money to get some toys and donate it to them, and I’m also going to build a Little Free Library where my grandma’s store is,” Basri said, adding that her grandma’s store is also in Indonesia. Duane Benjamin Sylvestre, an eighth grader at St. Pius X Regional School in Prince George’s County, Maryland, said that he plans to work with computers in the future, but he intends to keep reporting as a hobby. For his contest submission, Sylvestre reported on food insecurity in the region and what people have done to help those struggling to get food on their tables. In his video, he described a family in Bowie putting together 72 food hampers to give to underprivileged children in Alexandria, Virginia. He was actually talking about his family. Sylvestre added that he wants to use his prize money for buying extra parts so he can continue building his computer. Brendan Friedrich, a senior at Heritage High School in Loudoun County, Virginia, isn’t new to broadcasting. He said he has experience announcing for his school’s football and basketball teams. And, he added, radio has been a part of his life from early on. “I’ve listened to the radio since I was young, and I’ve always wanted to be in radio since I started listening to it probably eight or 10 years ago,” Friedrich said. For his winning submission, Friedrich, armed with his BrailleNote Touch, spoke about the importance of radio for people who are blind or visually impaired. And, mentioning the high unemployment rate for visually-impaired adults, he said he intends to “buck that trend” by going into broadcasting. Friedrich said he has hopes of being a news anchor and increasing opportunities for visually-impaired people. “It really doesn’t matter what the challenge is. There are accommodations out there,” he said. He said that he wants to put his prize money toward his broadcast career, which could mean improvements to his home studio, voice lessons or whatever else might help with his future goals.